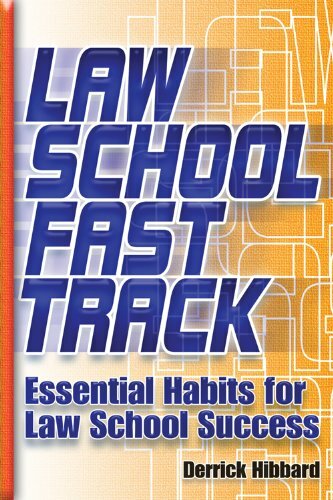 There's plenty of law school "how to succeed" guides on the market, but Hibbard's "Law School Fast Track" stands out from the crowd by following its own advice: identifying things that waste time and not doing them, and identifying and doing more of the things that are effective and efficient uses of your time. LSFT is a remarkably concise, yet thorough and practical guide to perhaps the most important part of law school - the first week (or the first few weeks). It's common knowledge that the grades you earn as a first year student often determine the kind of employment you'll end up with coming out of law school - firms interviewing for coveted summer positions between 2L and 3L have only your 1L grades to use to distinguish you from the other law students on paper, and I've seen many a great but slow-starting law student passed over for interviews based on an employer's GPA "initial cut", while lucky, smart or hardworking law students with decent 1L grades get the interviews. The importance of hitting the ground running cannot be overstated. Which is where LSFT comes into play. By narrowing the reader's attention to the important, efficient, effective and proven ways to immediately fit into law school in an academic sense, the reader will be able to walk into law school during that first week and make some sense of what's going on. Other guides - mine included (Later in Life Lawyers) - are perhaps guilty of overreaching and trying and do too much to soon. For the average incoming 1L, knowing about stuff that happens in the second and third years isn't as important as making sure he or she is fully understanding the stuff that is happening right now. I picked up a copy of LSFT and looked at its 90 or so pages, thinking, "Isn't this a little light?" But no, it's not. This is a sharply-focused book, and covers the vital first few weeks of law school in far greater depth than every other guide I have seen thus far. There's no material about how to pick a law school, how to apply, how to interview for law jobs, how to pick 2L and 3L classes, etc. There is, however, material about reading the law effectively, briefing efficiently, coping with your first week, and beginning to prepare for finals right from the start. In short, it tells you what you should be doing the moment you walk into your first law school class, and with luck, these habits will stick and see many a law student through a successful first semester, first year, and forward into their careers. This is the advice most law students pick up, overhear, or figure out over the course of the first year, but by then, it's too late in many cases to salvage a first class performance from what has generally become an stressful, expensive, and difficult trial by fire. Hibbard is that friendly, successful law grad who is willing to share his tips and expertise before you set foot in law school, rather than over a beer half way through your first semester when it's too late. This isn't a "law school" guide book in the traditional sense, and by "traditional", I mean a book that covers the entire law school experience from soup to nuts. Hibbard is right on the money with this book, and every incoming 1L should pick up a copy of this book, regardless of what other preparation has been done beforehand, and regardless of what study habits you think you already possess. It's a short read, but that's exactly what it should be - it cuts through the junk that isn't relevant to these vital few weeks of 1L, and offers simple, foolproof, and sensible advice that is so scarce in many a law school guide these days. This piece of work is right up there with those two other incoming-1L classics: Delaney's "Learning Legal Reasoning" and "How to Do Your Best on Law School Exams". Combined with Delaney's work, LSFT could round out the ultimate trifecta of 1L prep materials. Label: The Fine Print Press, Ltd. Manufacturer: The Fine Print Press, Ltd. Studio: The Fine Print Press, Ltd.